Perhaps a tad full on for a Tuesday, but chest la vie. How I'm feeling I suppose. I ate more chocolate that I usually do over the weekend. I've also had a hot cross bun everyday since last Thursday, and yes some were delicious home made paleo ones, but others were sourdough spelt ones, and I usually eat very little (borderline zero) grains. 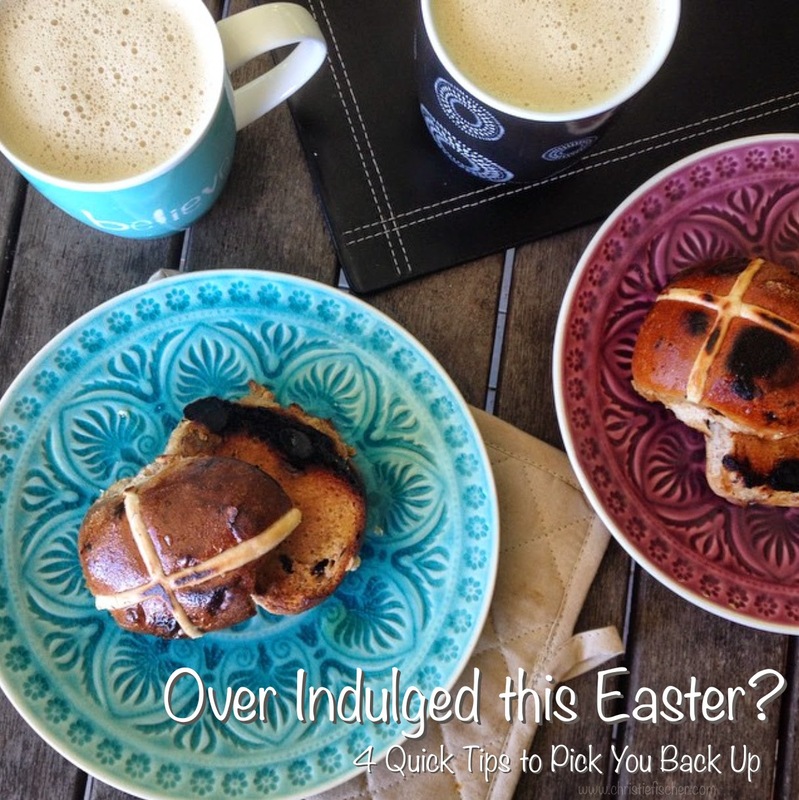 But they were so bloody good and I love hot cross buns so I was gonna eat 'em! Now that the long weekend is over, the chocolates are diminishing, and the hot cross buns are nowhere to be seen until next year (I hope)... I 'm sharing a bunch of tips to get you feeling better than ever once more. // What were your goals before the easter bunny fun set in? Oh that's right... it was to nix the sugar foods and train everyday. Cool. Let's schedule that in for the remainder of the week. Are you doing DVD workouts from home or are there a few gym classes you're going to get your pretty booty too? Write them in your diary, and grab your bestie to join you for added motivation, support and accountability. // What do you know makes you feel good? Fresh water creek swims? Movie nights? Art and craft? Focus more on these if you're feeling not so fab after the added foods and less movement this weekend just gone. // Get up off your booty and move. Walk, dance, cycle, barre, yoga, swimming, skating, squats, burps, pump classes... any form of movement where you SWEAT is a sure fire way to be feeling better in no time. Make sure you amp up your filtered water intake after wards as well. Now tell me girl... What are you committing too this week to get back on track?